Embark on the voyage of a lifetime through South Africa, from historic Johannesburg, Greater Kruger Area, and sumptuous winelands, to iconic Cape Town, the breathtaking Garden Route and finish with the relaxing beaches of Durban. South Africa captures the essence of the entire continent with its natural wonders, supreme wildlife, dazzling cities and friendly people. Visit Johannesburg to see an historical city undergoing an urban renaissance. South Africa captures the essence of the entire continent with its natural wonders, supreme wildlife, dazzling cities and friendly people. Visit Johannesburg to see an historical city undergoing an urban renaissance. Delve into the dramatic history of South Africa on a bicycle tour of Soweto and follow ancient migration paths as you track Africa’s Big 5, come face-to-face with lions, elephants, leopards, zebras, cheetahs and more during sunrise and sunset game drives. Drive through South Africa’s most stunning landscapes as you make your way through the winelands with your expert private guide. Delight in sensuous wines on stunning, scenic vineyard tours. Take in breathtaking views of cosmopolitan Cape Town from soaring Table Mountain to the brightly colored houses of the traditional Cape Malay community at Bo Kaap. 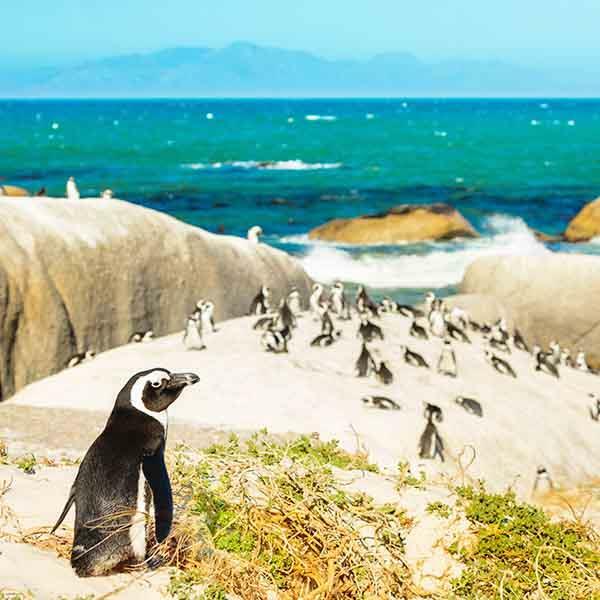 Explore the Cape, meet friendly penguins and more with your private guide. Explore the wonders and mysteries of the Garden Route where you create your own adventure each day with your private vehicle and expert guide. Visit Featherbed Nature Reserve and add activities like feeding ostrich, zip-lining, big cat encounters, explore nature reserves, caves and stunning coastlines... there is so much to choose from! Then finish with pure relaxation along the beaches in sunny Durban, along the Indian Ocean. As the sun sets, draping its golden light across the expansive landscape, you’ll wish your time here never had to end.